Ruta Kuzmickas appeared on Show 253, recorded in May 2012, at the age of 16. 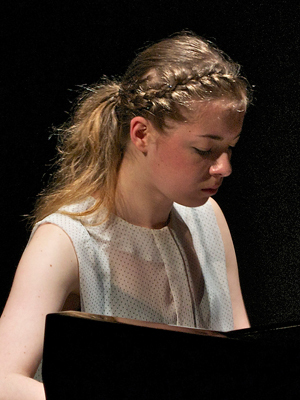 Ruta Kuzmickas (piano), 16, is from Portland, Oregon and is enrolled in Clackamas Web Academy. She studies with Jean-David Coen and is a recipient of the Jack Kent Cooke Young Artist Award. Ruta was a 2010-2011 Chamber Music Northwest Young Artist Fellow and performed with the Oregon Symphony when she was 13. She has taken master classes with Arnaldo Cohen, Gianluca Luisi, and more. She also plays in a piano trio and was one of ten pianists to receive a $1,000 renewable scholarship from the Chopin Foundation of the United States for 2011-2012. Aside from piano, Ruta enjoys drawing, dancing, and spending time with animals. Ruta is a Jack Kent Cooke Young Artist.